of which the magnification is slightly less (225x vs. 300x). Figs. 1, 5, 7, 8. Spongodiscus biconcavus. Fig. 1a-c: same specimen, different orientations. In the center, the shell is thick (figs. 1b and 1c), most dense (figs. la, 5, 8) and pores are small; then follows a broad, less dense region, with larger pores. Pylome is an opening without plating (cp. fig. 1b with S. resurgens forma osculosa in fig. 3). Spines may emanate from the margin of the disc (fig. la) or from its surface (fig. 1c). BSS 28B(II), BSS 34B(F) EF W30, RSW 90(F), BSW 51(11) EF H37. Figs. 2, 3. Spongodiscus resurgens, with forma osculosa in fig. 3. IOW 188(F) and BSS I IB(F) EF A35. Fig. 4. Spongodiscus glacialis, with glassy needle-like spines emanating from the margin of the disc. BSS 61B(F) EF 042. Figs. 6, 9 and 10. Spongodiscus anomalum. 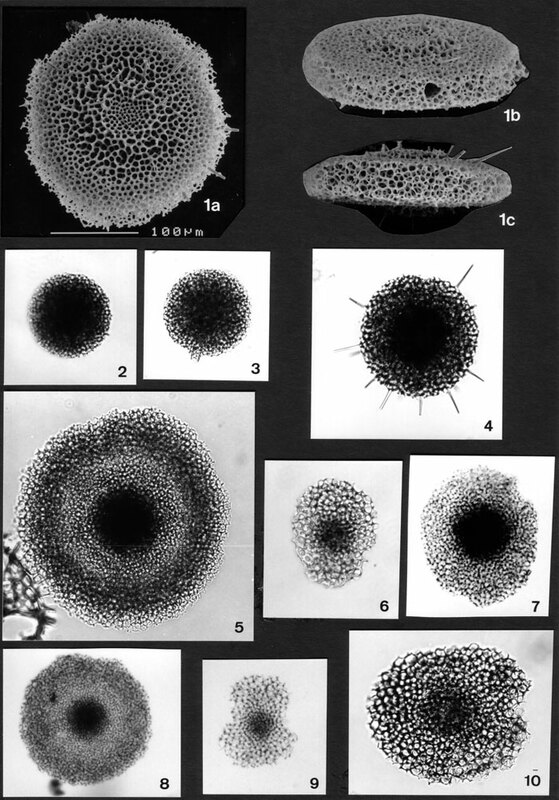 Note difference in pore-size between this form and other members of Spongodiscus. IOW 188(F), BSW 03(F) EF N37 and BSS 49B(F) EF W42.